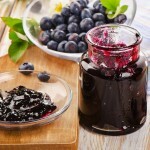 Redcurrant Jelly is a traditional accompaniment to Lamb. Currants are high in pectin so there shouldn’t be a setting problem. 1 lb (450 g) sugar per pint of juice obtained. Wash and drain the redcurrants. Pick over to remove any unsound fruit but do not remove the stalks. Put the fruit into a pan with the water and stew until the fruit is pulpy. Turn into a jelly bag and leave to strain for 3 or 4 hours. Measure the juice and heat in a pan. Add 1 lb (450 g) warmed sugar to each pint of juice, stirring until the sugar has dissolved. Bring to the boil and boil rapidly until the jelly sets when tested. Pot and seal whilst still hot. Can I use my juicer to get juice from red currents for making jelly. What is the procedure for making jelly using the juicer. I’m not certain it would work as you’ll end up with the skin as well which would probably cloud the jelly. Try Googling it – I haven’t got a juicer. I have made red current jelly following Delia’s recipe but after two days the jelly has not set. Can you help with a solution to make my jelly set? Try tipping it out of the jars. Re-heat and stir in some dried pectin (Silver Spoon). Don’t forget to wash and re-sterilise the jars before reurning the jelly to them. Just leave it and use it as a sauce with lamb, or ice cream, or whatever you fancy. I have had the same problem, and today been offered even more fruit SO….. I may try adding pectin to see if that helps. If not I will have to eat a lot of ice cream to use up all the jelly I have made, or buy more lamb. All the best. Hi Just made this jelly exactly as described above and it worked perfrctly. I tested for pectin using some meths and found there was more than enough pectin, if not you can squeeze in lemon juice to increase pectin. If the jelly is not setting, then it is most likely that you did not boil it long enough. Best way to check is to place a plate in the fridge and put 1/2 teaspoon on the plate wait for the drop to cool and push the drop from the side with your finger. if you see the surface crinkling then it is on. Hi, could you tell me how long you can store Redcurrant Jelly once made and in the jars? Also the same question about Courgette Chutney? 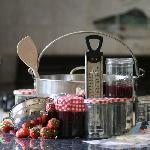 If you are worried about the keeping length of jams and preserves then I recommend using jars with a ‘pop’ lid. if the contents are boiling – or at least the pan has just come off the boil – when it goes into the jars (I suggest you use a ladle and a jam funnel) and you screw the lids on at once, then, to all intents and purposes, the contents will be sterile, and as they cool down, the lids will pop and the dimple in the lid will disappear, leaving a vacuum just like a store-bought preserve. I re-use old ‘Bon Maman’ jars, having been dish-washed to clean them thoroughly, I find it is sufficient for the jars to be plonked in a bowl of hot water when the jam is nearly ready, then the jars quickly dried and the jam poured in. I’ve never had one crack or break on me yet provided they are warm and dry. Made this way, even Lemon Curd (which has a notoriously short shelf life) will keep for 3 – 4 weeks. Jams and preserves should keep as long as their commerical equivalents. 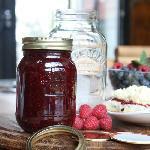 The easiest way to prevent mould growth in jam is to fill the jars, put the lids on straightaway, taking care to make sure they are screwed on properly, then turn them over and stand them upside down for 5 -10 minutes (no longer than this in case the jam starts to set). The boiling jam will sterilise the inside of the lids. Then turn them right way up and let them cool thoroughly. I never use wax discs and have been making jam and jelly for years without any mould appearing. Hi Val, I have a number of pink currants and am considering making jelly with them. Do I need to use the same amount of sugar as I would if using redcurrants-the currants seem a bit less sharp? I’d tend to use the same amount of sugar in order to get a set. This recipe worked a treat, though as a precaution, I added the juice of one lemon to the juice, when adding the sugar. The boiling of the fruit with water took about 15 – 20 mins. The boiling of the juice to setting point, took 10 mins. It tastes yummy. I’m in the middle of making this recipe and I’m a little concerned I may have added too much water. I’m at the straining stage and the juice that’s been produced so far is a little bit paler than expected. Would it make sense to boil it down a bit before I add the sugar? Also, has anyone tried flavouring this with chili peppers? I’ve tried a chili chipotle jelly which I loved with lamb and venison and wondered if it might be nice to try a bit of chili with redcurrant. Any idea how I would go about it? Lovely recipe!!! Quite fiddly but worth it. 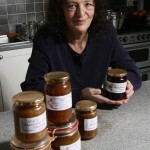 Great recipes, tried lots of the jams, jellies & chutneys over the past few years, mostly successful. Raspberry jelly tomorrow (cos my mum doesn’t like the seeds!!!) I’ve found to make the process a bit quicker, before putting the cooked pulp in the jelly bag, I press it through a metal sieve into a bowl & then use the jelly bag. Might be worth a try if you’re a bit short of time, or impatient to get the job done. 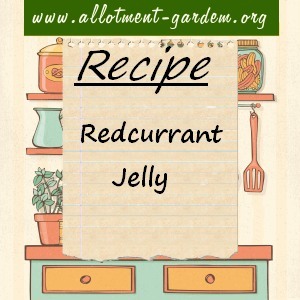 Excellent recipe – used it at Mum & Dads to ‘get rid of’ freezer red currants – beautiful jelly. About to repeat with my own freezer stock … fingers crossed! Thanks.